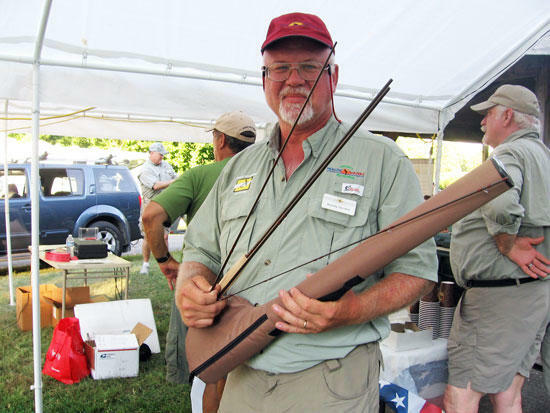 The weekend of June 22nd, members of the Middle Tennessee Fly Fishers of Nashville, in association with Project Healing Waters, treated some thirty disabled active military service men and women and veterans to a weekend of fishing on the Caney Fork River Friday, Saturday and Sunday. Project Healing Waters Fly Fishing, Inc. is dedicated to the physical and emotional rehabilitation of disabled active military service personnel and veterans through fly fishing and fly tying education, outings and teaching them how to do things that they would not ordinarily get in rehab through the military. Middle Tennessee Fly Fishers is one of the sponsors for Project Healing Waters in the Tennessee and Kentucky area. At this second annual event, thirty veterans came from Fort Campbell, Fort Knox, the V.A.’s in Murfreesboro and Nashville, and Operation Stand Down. They were given a complete weekend, an all-expense paid trip. All they had to do is bring themselves and their clothing for the weekend. They had campsites set up for them, food provided, and professional guides who took them down the river for fishing Saturday and Sunday. Randy Gerdes who is from Woodbury, is a Project Healing Waters member. He joined the program a year and a half ago, went through their program and now also mentors to others vets. Both he and his wife Terry, joined Middle Tennessee Fly Fishers last year and both are involved in the PHW program. At this year’s event, there was a fishing contest and Randy was one of the big winners. He received a Sage Fly Fishing Rod from Fly South for catching the biggest Brook Trout of the day. To end the evening on Saturday a special observance was held at the Longbranch Campsite on the banks of the Caney Fork River below Center Hill Dam to recognize the veterans. The program featured remarks by Many-Bears Grinder, Commissioner for the Tennessee Department of Veterans Affairs, State Senator Mae Beavers, State Representative Terri Lynn Weaver, representatives of the U.S. Army Corps of Engineers, and members of the Middle Tennessee Fly Fishers and Project Healing Waters. Each veteran received give away prizes, pins and certificates of appreciation. News Channel 5 was there filming all day Saturday for an upcoming special in July on News Channel 5+. This event couldn’t have been put on without the help of a countless number of volunteers.